On September 30, the Distinguished Gentleman’s Ride 2018 will be held. Around 120,000 participants are expected to participate in rides in 650 cities worldwide. In a classic wardrobe, the participants ride their motorcycles for a good cause. The history of the Distinguished Gentleman’s Ride dates back to 2012. To improve the image of motorcyclists, Australian Mark Hawwa launched the initiative for a nationwide ride. All motorcyclists should present themselves as gentlemen in adequate clothing. The action was such a great success that donations for a good cause were already collected at the follow-up event – for the fight against prostate cancer. This concept has been retained and exported around the world. Around 120,000 participants have already registered for this year’s Distinguished Gentleman’s Ride, with rides taking place in 650 cities worldwide. The local rides were initiated by participants who raise as many donations as possible for »their« ride. The most successful fundraiser is awarded. The Distinguished Gentleman’s Ride is open to all motorcyclists who enjoy classic British clothing and own a classic bike. The standard reference for motorcycle friendly accommodations. About 500 addresses proved and accepted as »TF-Partnerhaus«. You’ll find all houses in the web, in the printed hotel-special as well as in the web-app (also suitable for smartphones). 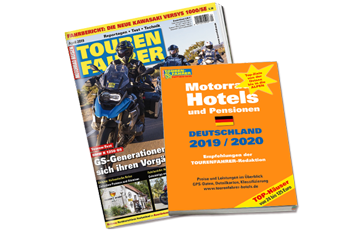 © Copyright 2019 MOTORCYCLE RIDER – motorcycle test, travel, accessories and sports. All rights reserved.